Touring fun! Robert Coxon, Dr. Todd Ovokaitys, Lee Carroll, Ilan Cohen (our Israeli host), and Rae Chandran... hey, isn't he the Kryon host for Japan? 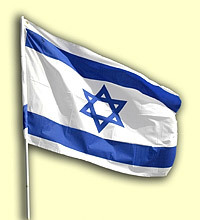 (yep), have fun around the north of Israel (the Sea of Galilee, and also Jerusalem. We had fun ALL OVER Israel. 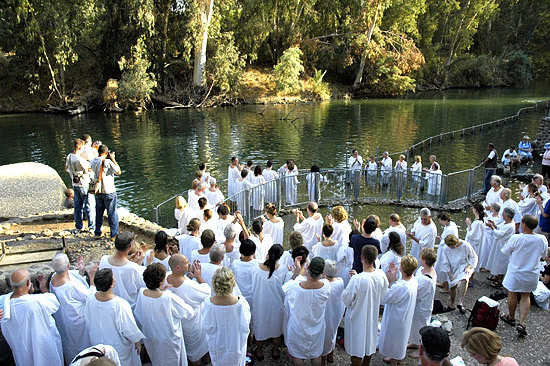 The River Jordan, where Christ was baptized, is a favorite for groups who come do to the same thing. 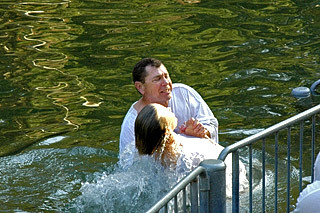 Here a fundamentalist Christian group from the USA enjoy this very profound step in their faith. 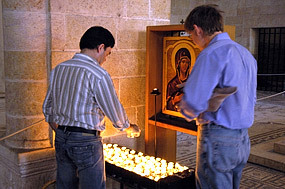 This area is rented out for groups of all denominations to do this. They even supply the robes and towels! 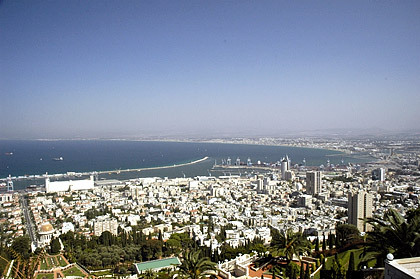 (above left) Haifa is Israel's largest port. It is also the home of the main temple of the Baha'i faith (barely seen at lower left). 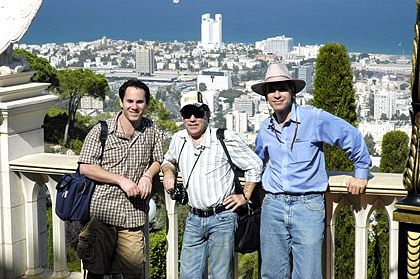 (above right) Ilan, Robert, and Todd with Haifa in the background. 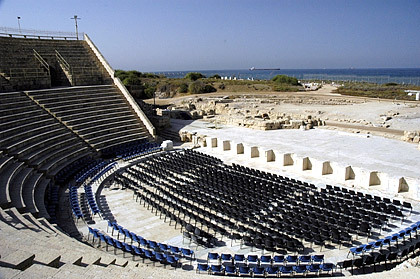 (above left) Caesarea, and what is left of the theatre. The folding chairs are not ancient... just in case you wondered. 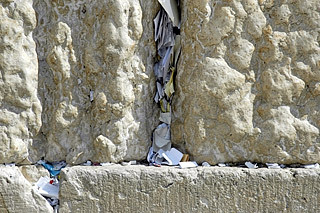 Romans played a very important part in Israel's history. Folding chairs didn't. 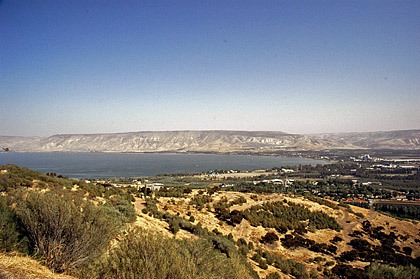 (above right) the Sea of Galilee. 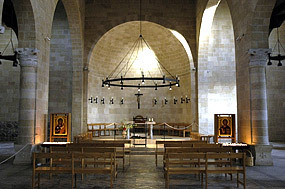 (above) The Church of the Loaves and Fishes. 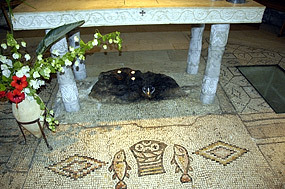 This is where the miracle of the loaves and fishes was performed... right here! The energy in the church was precious and awesome! 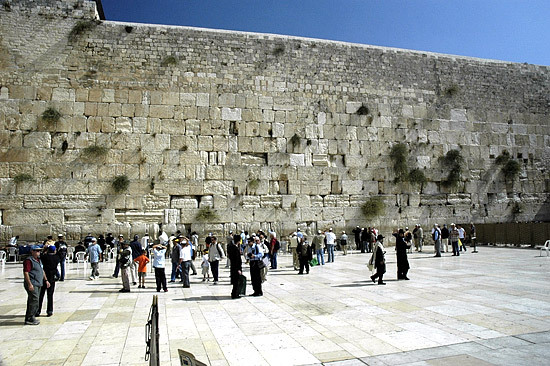 (above left) A far view of the Western Wall. This is the only remaining portion of the 2nd Temple, built by King Herrod, and destroyed by the Romans. 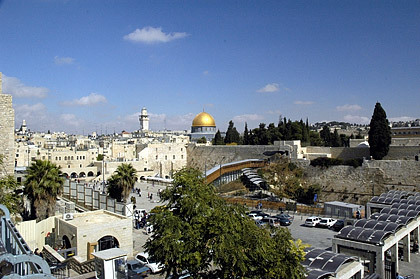 The "Dome of the Rock" (golden dome) seen in the center is currently an Islamic Mosque. 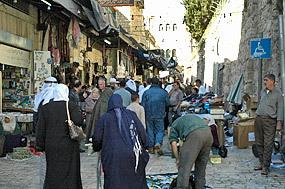 It is also precious to the Jews, in that this was the place where Abraham almost sacrificed Isaac. 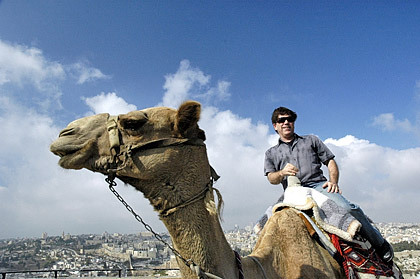 (above right) A dromedary animal with one hump, being irritated by a musician from Canada. This is a very respectful and precious place. 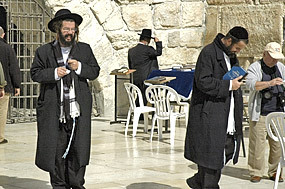 Even if you are not Jewish, you are required to wear a head covering in honor of the tradition of "God Above." We all did. 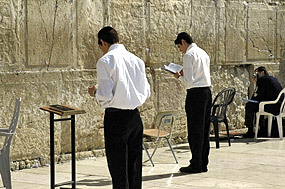 At left are some of the prayers left in the cracks of the wall. Ours were for peace in this historic place! 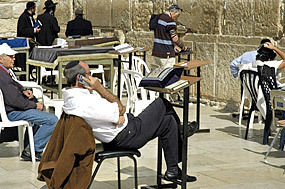 (above left) The guy with the cell phone. Is this Kosher? 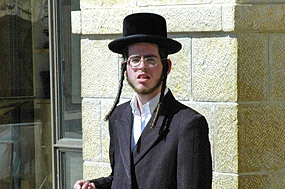 (middle) A Hasidic fundamentalist Jew. 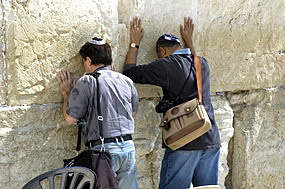 (right) Robert and Rae honor the wall. 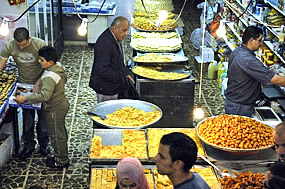 (above photos) The Arab Quarter. It's safe as long as you are a tourist! Wear tennis shoes and look like you are from Ohio. 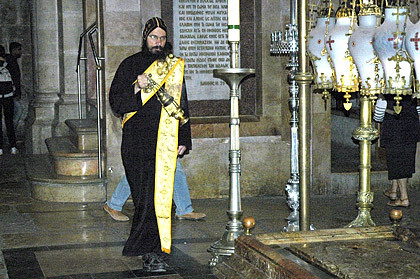 In the Church of the Holy Sepulchre, where Christ was crucified, buried and reported to be resurrected (the church is built over the site), a Greek Orthodox priest spreads incense at the holy areas. Boy does he look filled with the love of God, huh? Many of us felt that those who are stewarding this place have lost their sense of history and faith. They were a very surly lot! Perhaps this guy is just mad that he has to wear a size 20 shoe! (Well, it looks that way) This place was buried and uncovered a number of times, depending on the rulers.. Romans, Islamic, through history. Each wanted to destroy it. Now it is protected, although much is disputed about who should be actually be responsible for stewarding it. 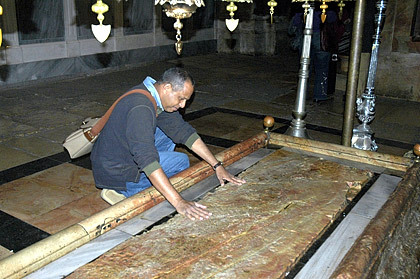 (above right) Rae Chandran places his hands on the slab that was reported to have carried Jesus from the cross to the tomb. 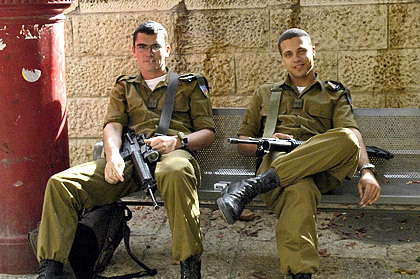 (left) The ever-present Israeli soldiers. 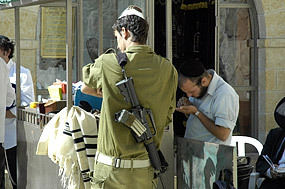 Every Israeli male (except Arab citizens) spend 3 years in the army... automatic at age 18. 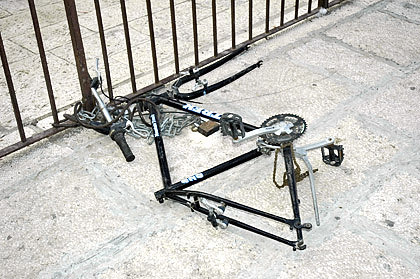 (right), the sure way to NOT have your bike stolen. Take the seat and the wheels with you. Note, that it's still chained and locked up! This is the last photo Lee took from his hotel window before packing to go to the airport. 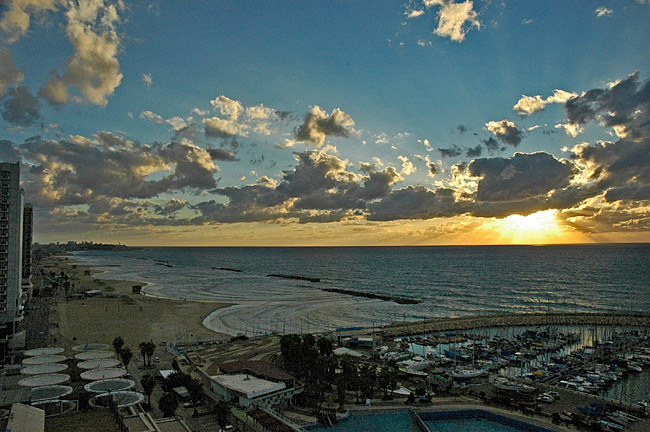 "I highly recommend DubiTours for any Israel touring. 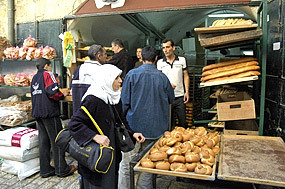 Private van, great information, led by a sensitive Israeli man of great experience."